The movie itself is based on a Broadway show, which I haven’t seen and am not likely to. Musicals seem to lose something, artistically speaking, when they transition from Broadway to Hollywood. The shows were written for the stage, and grafting them onto another format typically doesn’t work too well. I enjoyed RENT a lot when I saw it on stage, but I couldn’t make it through to the end of the movie version. Mamma Mia was the same thing: the musical was entertaining, but the film version, not so much. With that in mind, Tom Cruise, Alec Baldwin, Catherine Zeta-Jones, and a number of other Hollywood actors took a shot at turning the musical “Rock of Ages” into a movie. I’m a child of the 80s, and I’ve written about the music from that decade many times here. So it was fun to hear some of these songs in a movie, even though I didn’t much care for the two leads at the center of the obligatory romance story (Julianne Hough and Diego Boneta). The Glee-style mashups of “Juke Box Hero/I Love Rock and Roll” and “We Built this City/We’re not Gonna Take it” seemed unnecessary to me, too. They’re songs that can, and should, stand alone by themselves, at least in my mind. I realize that makes me somewhat old-fashioned, or at least a purist, but so be it. I’ve been called worse things. The gay subplot between Alec Baldwin and Russell Brand’s characters was certainly funny, but gay issues themselves weren’t really visible in the 1980s. I have no doubt that closeted romances like that existed, but consider what happened to Judas Priest frontman Rob Halford. Before he came out in 1998, he had left the band in 1992, and they continued on with with a singer from a Judas Priest tribute band in his place. Halford says that the music scene today is different than it was back in the 1980s, but it wasn’t the way that Rock of Ages suggests, either. The Baldwin and Brand characters would have had to keep things on the down low, to use a more modern phrase. 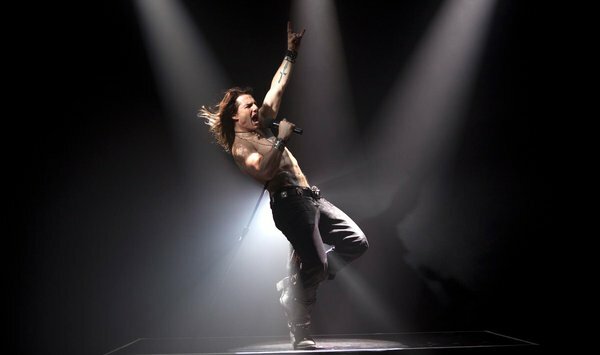 But the biggest disappointment was Tom Cruise’s channeling of Axl Rose, singing Def Leppard’s “Pour Some Sugar on Me” and Bon Jovi’s “Wanted Dead or Alive“. He mangled the songs, in my mind, and I’ll hope that anyone who hears them in the movie also buys the original source material on iTunes. It can’t be that the Tom Cruise version of these songs is the only version that a person gets to hear. My daughter liked the part in the movie about the boy band, named “Z Guyeezz” who were clearly a shot at New Kids on the Block. The rockers in the movie show their disdain for this record-company concocted act, but it does have an element of truth to it, I suppose. These bands are created in a lab, so to speak, in order to fill a perceived need in the marketplace, without regard to whether or not they’re any good, musically. And so it was last night, as I waited for Big Time Rush to take the stage after a couple of lightweight opening acts. When they finally went on, and the teen screaming began in full force, I posted on my Facebook page that the current version of “Z Guyeezz” had just gone onstage. My daughter indicated that this annoyed her, probably because it hit a bit too close to the bone. We both laughed at the ridiculous boy band in the movie, but not even two months later, there she was in the crowd at just such a show, with me along to serve as her driver, and to pad the show’s gate receipts. I love my 80s hair metal, and I always will, so Tom Cruise and the others can sing it if they want to. I’m sure that REO Speedwagon and Night Ranger and Foreigner and all of the others featured in the movie are getting a nice income boost as a result. But as far as the movie-from a Broadway play-about the years I was growing up is concerned, I’ll keep the actual period in mind, and let Broadway and Hollywood off with a polite, yet firm rock and roll salute. And not the two-finger variety that Tom Cruise gives in the picture above, either.